Create gorgeous hand-crafted cards and projects without leaving home! No more frustrations with missing supplies or a lack of ideas! Have you ever looked at a paper crafting magazine and been blown away by the quality and sophistication of the work, only to be frustrated when you tried to create the same cards or projects? I can help you end those frustrations… say hello to STAMPS IN THE MAIL CLUB! The Stamps in the Mail Club will allow you to create impressive cards and 3-D projects in a fraction of the time normally spent designing cards, and with a fraction of the investment in supplies usually associated with such elaborate projects. In addition to saving time and money on your cards, you’ll love having all the supplies pre-cut and on hand when you sit down to stamp–no more searching for what you need! My Stamps in the Mail Club has been proven for nearly 14 years–don’t miss the opportunity to join the stampers “in the know”! Looking for past Stamps in the Mail Club kits as featured on the LovenStamps YouTube channel? Click here for availability of Past Kits. Give Stamps in the Mail Club a Try – no ongoing commitment required! 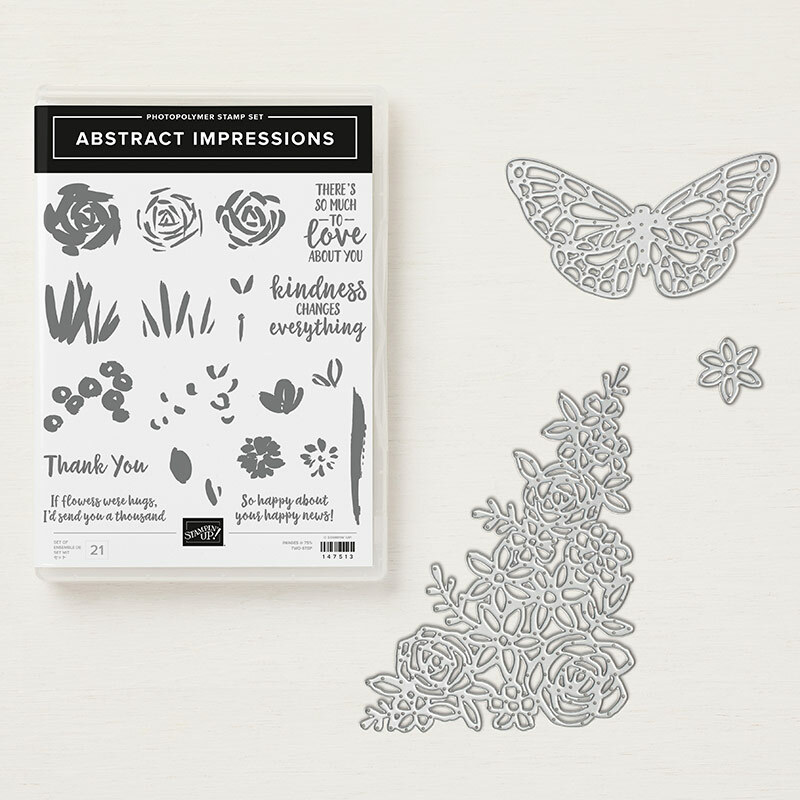 In April you’ll receive the ABSTRACT IMPRESSIONS stamp set with your project kits – along with Stampin Spots in Shaded Spruce, Soft Sea Foam and Calypso Coral. 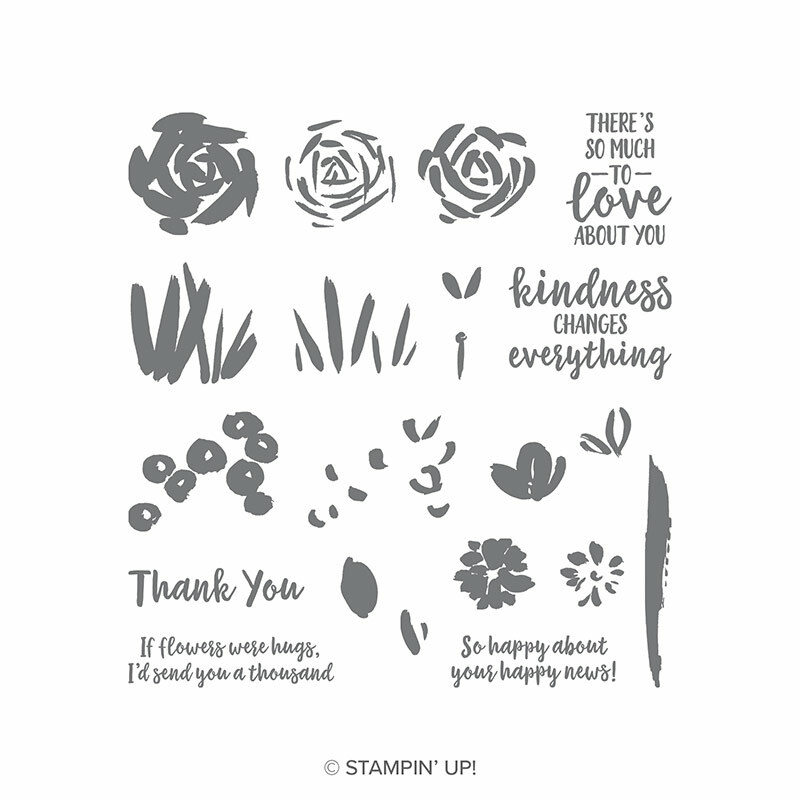 You’ll also have the option to upgrade to add full size ink pads instead of the Stampin Spots, add the Garden Impression Product Suite Bundle, and you’ll likely want to add the coordinating Springtime Impressions Framelits Dies to your kit! You’ll make 4 projects with your April Stamps in the Mail Club kit – all featuring the gorgeous abstract images from the Garden Impressions Suite, including a clever gate-fold card, plus a springtime banner home decor project – perfect for a gift or to add a touch of spring to your own home. The projects feature supplies from the Garden Impressions Suite on pages 128-130 of the Annual Catalog. You will love this beautiful suite! Add Springtime Impressions FRAMELITS DIES:You’re going to love these dies that coordinate with many of the stamp elements plus add design elements – add $26 (reg $29 plus shipping/tax). Get coordinating elements from this fun suite for more stamping at home – add $42 (Occasions Catalog page 128-130). Available in April ONLY: UPGRADE with the Springtime Impressions Framelits, full size Stampin’ Pads and Garden Impressions Suite! You’re going to love these dies that coordinate with many of the stamp elements plus add design elements – add $26 (reg $29 plus shipping/tax). Look at what the Stamps in the Mail Club can do for you! Easy to follow: Pre-printed directions for all 4 projects in a color handout with photos and step-by-step instructions will be sent with the kit each month and necessary supplies are listed at the top of each project so you know exactly what to have at your fingertips. To order your Stamps in the Mail Club kit AND receive your $67 in free gifts, just click the button below to receive an invoice from Meg for your April payment. Around May 1, you’ll receive the Sneak Peek email for the May Stamps in the Mail Club Kit – just respond at that time if you’d like to continue stamping with me by mail! “I have only had the chance to enjoy one month in your Stamps In The Mail club so far. But I love it. Your project quality and videos are so wonderful. I feel like I am in your stamp room/office right with you – stamping together. For anyone thinking about joining….I say Do it! You won’t be disappointed.” – Sandi W.
“I’m enjoying your stamps in the mail club SO much. It has really inspired me for my other card creations.” – Robin J. “I want you to know I always look forward to your card kits – getting your kits in the mail is like Christmas all over again each month. ” – Jackie D.